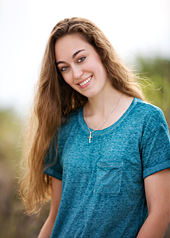 Alexis R.-This was our first year traveling on the March for Life pilgrimage. We’ve wanted to go previous years, but busy schedules got in the way of that. This year though, we were bound and determined to go. We wanted to prove how important life is. Friends who had gone previous years had also said how fun the trip is with getting to see the sights and everything. So on Wednesday morning, January 20th, we had mass at the St. Joseph Cathedral in Sioux Falls with all of the pilgrims coming from our diocese, and then we headed off. Our diocese took two buses and on our bus were the Aberdeen boys with all of us Yankton girls. At first, the boys stayed in the front and the girls stayed in the back, but after Emily, the director of the whole trip, had us play a little get to know each other game, we were soon all close friends. 26 hours together on a bus really brings people together. 😉 We had fun and passed the time by playing cards, singing songs, and enjoying each others’ presence. With storm Jonas coming in, Emily and the other chaperones were trying to figure out what to do. Emily didn’t know whether we should leave right away, leave after the March, or stay in D.C. until the storm dies down. She prayed to Mary and she could hear her ask, “Why did you come all this way, what was the purpose?” Emily knew then that we were going to stay for the March and then leave right after it’s over. I was super bummed that we wouldn’t get the extra day on Saturday to sight see because I had never been to D.C., but I had to remember the whole reason why I was coming. We arrived in D.C. on Thursday afternoon and went to the Life Is Really Good rally down in Fairfax, Virginia. A couple of really good bands played, we had an awesome speaker talk about the great gift of life, and then we ended the night with adoration. The following day was the March. Emily told us that we would have two hours that morning to sight see or do whatever before the March and rally started. A couple of the Yankton girls, including my sisters and I, along with some of the Aberdeen boys and chaperones decided that we were going use those two hours to do as much sight seeing as we could. Everyone else thought we were crazy and that we wouldn’t get to see very much in that amount of time, given that we had to travel D.C. on foot. With the help of one of a very good navigator chaperone, we got to see the White House, and visited the National Mall (monuments, war memorials, etc.) We got back to our hotel just in time and headed off to the rally with everyone else. The rally took place at the Washington monument. At the rally, we listened to some powerful speakers, including presidential candidate, Carly Fiorina. By the time the rally was over, little snow flakes had just begun to fall. We marched down Constitution Avenue, up Capitol Hill, and then turned right and marched past the Supreme Court building, where the march ended. It was really cool being on top of Capitol Hill and looking back and seeing all of the marchers marching behind. I was astounded to hear that there weren’t nearly as many marchers as the previous years due to the storm, because there were so many people there! It was awesome seeing that many people who were willing to sacrifice the cold and snow to make a statement for what they believe is right. We then got on the bus and headed home. At least, we thought. Little did we know that we would get stuck at mile marker 132.8 of the PA turnpike. 🙂 When we first got stuck at around 9 pm Friday night, no one really knew what was happening, but Emily said we would be out soon. The next morning we all awoke, and we were still stuck. We heard that up ahead a couple semis couldn’t get up a hill and had an accident. It backed up traffic for miles. After being stuck for awhile, the snow started to fall, making the whole situation even worse. We were all very frustrated, upset, tired, and hungry. It was then that we heard about the outdoor mass that was going to take place right on the side of the turnpike at a couple buses behind us. I, and everyone else, figured there was nothing better to do, so why not go. I was so happy I chose to go! It was definitely the coolest mass I had ever been to. 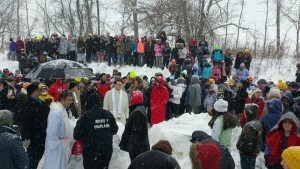 The bus who decided to do the mass (the Archdiocese of Omaha I believe) created an altar out of snow, and they happened to have a container of hosts in their bus. There obviously weren’t enough hosts to go around to all the people who attended, but they did as best they could. At my spot on top of the hill, I was able to overlook the whole mass and I had an awesome view of it all. I think the mass really lifted everyone’s spirits, and we were in really good moods the rest of the day. It was what we all needed. I think it was so cool that the mass took place right by our bus, because the buses and other people stuck 10 miles back had no clue that we were doing it. I feel so lucky to have been able to take part in it. A guy from my diocese posted a video of the mass on Facebook, and it has nearly 800K views. Because of that Mass, the March for Life got so much more media attention, when it usually gets hardly any. It was God’s plan all along for us to leave early, have a Mass, and show everyone the extents we were willing to take to make our statement of life known. What a blessing. We spent rest the day playing in the snow, meeting new friends (including a band and some Duquesne University basketball players), singing and dancing and having a good time, making the most out of the situation. The National Guard brought pizza, putting us in even better moods, even if we only were able to eat half a slice. Finally, we got out. Emily told us that a church in Bedford, PA were letting us sleep in their church, so that we wouldn’t have to spend another night in a crooked position with our neck hurting in the morning, on the bus. We also heard that they were making us a homemade meal, something we hadn’t had in awhile! I was so grateful. The next morning around 7, we left, and were finally on the road for home. We arrived in Vermillion around 6 am on Monday morning. I was so happy that I didn’t have to go to school! I didn’t want to get off the bus because I didn’t want to leave everyone that I had become so close with, but I really wanted to take a shower and sleep in my own bed. My friends and I on bus 1 still keep touch over a group message. We arrived home at around 7 that morning, I took a long, hot shower, and then slept the whole day. Our chaperones were awesome, and they were always looking over us and making sure we were all safe. Emily was great, and I am so thankful for her and everyone else. Our bus driver, Jerry, also deserves a lot of credit. He made sure to balance the amount of gas we had on the turnpike, by turning on and off the bus at intervals to keep us warm. He was also in a great mood the whole time, and he helped lift our spirits. I’m not even sure that he slept at all that entire time. He was such a trooper and we love him. Alexis R.-I wouldn’t trade this trip and experience for anything. It really made me realize everything I take for granted and I know appreciate everything so much more, including my life. I can’t thank my mom enough for choosing life. So many women think that it is their choice to decide whether their baby gets a life or not. In reality, it’s God’s choice- no one else’s. Life is such an awesome gift, and all lives need to be respected. That goes for other things like human trafficking too! We need to do all that we can to put these things to an end, so that everyone sees what a high value life is. see lines starting to form to receive the Body of Christ. We had a guitar player and a drummer and they started to sing my all time favorite Christian song- “Lord, I Need You” by Chris Tomlin. I was stranded 1,000s of miles from home, my toes felt like they were going to fall off, but I had never felt so happy! I can’t even describe the joy I felt. I was in awe. God was there and I knew it. I just remember thinking how blessed I was to be able to be a part of something so simple and yet so miraculous. I think it really encompasses what the Catholic faith is all about. Through this experience, I have realized that God really does know what He’s doing. The March for Life is the largest gathering of protesters Washington sees all year. However, the media doesn’t give it an ounce of attention. This year things changed. It is because we got stranded that people started to notice us and our pro-life movement. Our turnpike Mass went viral and has touched the hearts of hundreds of thousands. And if you think about it, this blizzard was the most ideal storm we could’ve got stuck in. It wasn’t windy. It wasn’t miserably cold. Although we had limited food and water, we still had plenty to make it through. It provided an opportunity for all of us out there to draw closer in our faith. And I’d bet any money if you asked any single one of us if we would do it again, we would all say 100% yes. God has a plan, you just have to be willing to go with it. 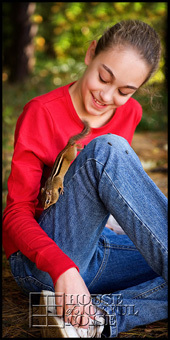 Lauren R.-When we returned home, we didn’t get a warm welcome like we hoped. Instead we got some criticism and hate for going to March for Life. On Facebook there were comments about us saying things like, “They deserved to be stuck out there (the turnpike) with no food and water.” At school, one guy shouted “I love abortion” at us whenever we passed him in the hallway. It was kind of shocking because none of us were expecting it. But it also opened our eyes a little. When we were in DC, we were surrounded by people who all believed the same thing. It was easy for us to stand up for what we thought was important. But once we got home, we realized that not everyone has the same beliefs as us and they will make it known. We just need to stick together and keep on fighting for the gift of life, and let others see God through us. 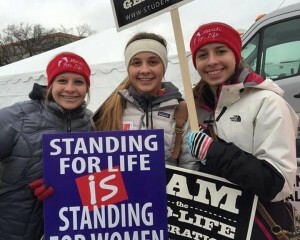 Thank you so much to Alexis, Kristen, and Lauren for sharing their testimony and standing up for life! I enjoyed reading these girls’ testimonies, so very much. The buses carrying all of these marchers for life, and holding Mass on the side of the turnpike, certainly made the news! This happenstance, although seemingly unfortunate, very much helped put a spotlight on the March of Life event, that SHOULD have a spotlight, every single year. (Until a march for the sanctity of life isn’t needed, anymore. Wouldn’t THAT be an answer to our prayers?!). I am thankful that these girls were able to have this unforgettable experience, and have this story to tell. They, and so many faith-filled like them, are the hope and courage of their generation, and the future of the world. May God bless them, and the voices they are using on behalf of the unborn. -life changes but for the BETTER!! !